With the start of 2019, you all must have set out many distinct plans for the year coming. Out of all hustle, it is important for us to remember- that like every year government stipulates some financial deadlines for some cruicial events like tax filing etc, the governement must have reported for some important financial deadlines for 2019 as well. All those individuals who do not have a PAN card and make transactions amounting to Rs 2.5 lakhs in one financial year, will have to apply for a PAN card on or before May 31, 2019, failing to this may attract excessive attention from the tax department. 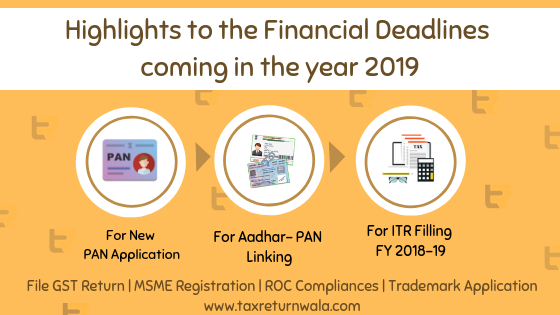 On June 30, the Central Board of Direct Taxes (CBDT) extended the deadline for linking PAN card with Aadhar to March 31, 2019, failing to this will result in the document becoming invalid. In case you have missed filing of tax returns for the financial year 2017-18, it should be definitely submitted on or before March 31, 2019. In case of any such failure, the tax department will first send a notice, through which the procedure can be completed. Those who usually file belated ITRs shall be aware of the fact that the tax authorities will levy a certain amount of penalty as per current income tax laws and will have to pay a fine of Rs 5,000 if the Income Tax Return for 2017-2018 is filed on or by December 31, 2018. It is ideal to file ITR by 31st July, 2019 as soon as the financial year ends on March 31, 2019, unless the government plans to extend it. The tax department usually levies a fine on the basis of your income group in case of non-compliance. It is advisable to claim pending tax benefits, reimbursements and allowances for financial 2018-19 before the end of the financial deadline of year i.e. March 31, 2019. Why to go for a Last Minute Rush ! Start your tax planning with us from today onwards ..